If you’re looking for the best stick welder you’ve come to the right place. This guide will provide objective, informative and practical information to assist you in making the appropriate choice. We also review several excellent models that we think are best for you. Stick Welding, also known as Shielded Metal Arc Welding (SMAW) or Metallic-Arc welding or Arc Welding, is extensively used in welding ferrous and nonferrous metals. It has many applications for producing a vast assortment of metal products. Stick welding is found in the shipbuilding industry and in the construction industry for fabricating girders, beams, and columns. Because it is easy to use and portable, stick welding is universally used in the repair and servicing of equipment, machinery, and a host of other items. The stick welding process is one of the simplest and most versatile arc welding processes. It can be used to weld both ferrous and non-ferrous metals, and it can weld thicknesses above approximately 18 gauge in all positions. The arc is under the control of the welder and is visible. The welding process leaves slag on the surface of the weld bead which must be removed. The most common use for this process is welding mild and low alloy steels. The equipment is extremely rugged and simple, and the process is flexible in that the welder needs to take only the electrode holder and work lead to the point of welding. Stick welding equipment is cheap and simple to use and people with very little training and practice are able to use the stick welding process to make reliable welds. A skilled operator can use the stick welding process to weld practically any material in virtually any situation. The stick welding process is also less susceptible to winds and drafts than other arc welding processes, making it ideal for outdoor applications such as bridges, navy ships and oil refineries. How Does Stick Welding Work? To find the best stick welder, the first thing you need to know is how the stuff works. If you have previous welding experience, feel free to skip ahead. If you’re a beginner this section will give you a better understanding of how stick welding works. produce a light, protective coating, called slag, over the weld. The slag is removed by tapping the weld with a chipping hammer or chisel and cleaned off with a wire brush. The stick welding power source provides constant current (CC) and may be either alternating current (AC) or direct current (DC), depending on the electrode being used. The best welding characteristics are usually obtained using DC power sources. 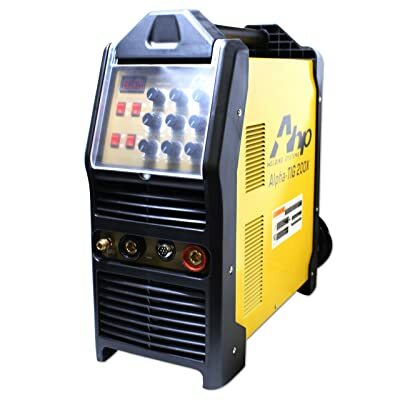 For efficient welding, the best stick welders should enable precise control of the current, like this AHP AlphaTIG 200X 200-Amp IGBT AC DC Tig/Stick Welder. The power in a welding circuit is measured in voltage and current. The voltage (Volts) is governed by the arc length between the electrode and the workpiece and is influenced by electrode diameter. Current is a more practical measure of the power in a welding circuit and is measured in amperes (Amps). The amperage needed to weld depends on electrode diameter, the size and thickness of the pieces to be welded, and the position of the welding. Thin metals require less current than thick metals, and a small electrode requires less amperage than a large one. Before moving on to discuss the major difference between Stick and MIG/TIG welding and how to pick the best stick welder for you, here are some of the pros and cons of this oldest method of welding. Stick welding is widely used because of its versatility, portability, and comparatively simple and inexpensive equipment. In addition, it does not require auxiliary gas shielding or granular flux. Welders can use the stick welding machine for making welds in any position they can reach with an electrode. Electrodes can be bent so they can be used to weld blind areas. Long leads can be used to weld in many locations at great distances from the power source. Stick welding can be used in the field because the equipment is relatively light and portable. STICK is also less sensitive to wind and draft than MIG and TIG welding processes. Stick welding can be used to weld a wide variety of metal thicknesses. It’s more useful than MIG and TIG for welding complex structural assemblies because it’s easier to use in difficult locations and for multi-position welding. Stick welding is also a popular method for pipe welding because it can create weld joints with high quality and strength. Operator duty cycle and overall deposition rates for covered electrodes are usually less than those of a continuous electrode process – MIG welding. This is because electrodes have a fixed length and welding must stop after each electrode has been consumed to discard the remaining portion of the used electrode clamped into the holder and reapply another. As being said, stick welding may be used to weld a wide variety of metals. But this process cannot be used to weld Zinc, Lead, Tin, and Magnesium because of their low melting points. Aluminum, Copper alloys, and Nickel can be welded by stick welding, but it is not very popular. MIG and TIG are more widely used for welding these metals. That’s why several best Stick Welders are the combination of Stick / TIG or Stick / MIG, or all-in-one Stick / MIG / TIG like the Miller Multimatic 215 Multiprocess Welder. With these welding machines, there is no restriction to doing any kind of welding job. Even though you’re here to find the best stick welder that suited to your needs, understanding the difference between this welding method and other welding methods is the key to making the wisest decision. MIG welders use a wire welding electrode on a spool that is fed automatically at a constant pre-selected speed. The arc, created by an electrical current between the base metal and the wire, melts the wire and joins it with the base, producing a high-strength weld with great appearance and little need for cleaning. MIG welding is clean, easy and can be used on thin or thicker plate metals. It does a very good job on steel, aluminum and stainless and has the ability to weld materials as thin as 26-gauge. The use of a shielding gas allows the welder to operate at a continuous rate, making the process fairly quick. While all types of metal can be welded with the MIG process, different materials require different wire and gases. Finally, MIG Welding is fairly difficult to use outdoors due to the gases involved. And it’s also cannot work well in windy conditions or on dirty materials. That’s why we think a combination model like the Smarter Tools INMIG-185iD 180 Amp Dual Voltage Inverter MIG/Stick Welder is very well worth considering. This is one of the best stick welders on the market that is capable of MIG welding. TIG welding is a welding process that creates an electric arc between a non-consumable tungsten electrode and the workpiece. The arc heat melts the parent metal. A supply of inert shielding that excludes atmospheric gases from the weld zone gas is introduced around the arc. Filler wire may be introduced into the weld area. TIG welding is most commonly used to weld thin sections of alloy steel, stainless steel and nonferrous metals such as aluminum, magnesium and copper alloys. TIG welding provides the cleanest, most aesthetically pleasing work possible. The process grants the welder a great deal of control over the weld, allowing for stronger, higher quality welds. TIG is much harder to learn than the stick welding. It requires a highly skilled operator, as it demands the simultaneous use of both hands and a foot. TIG welding is also significantly slower than either MIG or Stick welding, and demands that the surface of the workpiece be absolutely immaculate. All paint, rust, and debris must be removed, and the weld area should be clean enough that you could eat off it. In summary, when it comes to welding something that you want it looks perfect, TIG welding is far better than stick welding. In a nutshell: Which is the best for me? We think, that depends on your needs. For building a DIY welder, Stick welding is cheapest and simplest. It is a versatile starting point. Great for farm repairs as it is the most portable. If you plan on doing bodywork, then MIG welding is best. That will require adding a wire feeder, gun, gas bottle, and regulator to the basic arc set up. We prefer MIG welding for its clean welds. However, if you need to lug the welder out somewhere for a quick fix, we think stick welding is the best choice. If you are building something like an off-road buggy frame, then TIG is preferred as you have the most control over the welds. One of our experts said that he use stick welding for almost 80% of the time. He only uses TIG welding for aluminum and MIG welding for thin metals. He said he prefers a Multi-Process model like the POWER MIG 210 MP Multi-Process Welder. This welder is considered as one of the absolute best stick welders available that is capable of TIG, MIG, and Flux-Cored welding. How to Choose the Best Stick Welder / Stick Welding Machine? When it comes to choosing the best stick welder, here are some important features to look for in a stick welder. The most popular feature in stick welders according to many users is the DC power option. While AC will be sufficient for many welding projects, DC runs smoother. The difference is significant enough that welders who have DC as an option rarely ever use AC power. 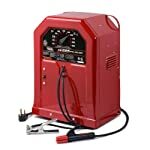 As with any welder, you’ll need to make sure your unit has enough power to complete the jobs you have and that you have a power outlet that can handle the voltage of your machine. Why the best stick welder should come with DC output? The average home welder doesn’t need a DC Welder. However hobbyist can accomplish a lot with an AC machine, provided it’s used with the right rod. Most electrodes run better on DC when compared to AC, and almost everyone uses a DC welder if given the option. Also, some rods for special purpose welding will only run on DC. AC stick welding machines have handled many large and small projects over the years, so you can certainly do quite a lot without the DC option. If you have to choose between an AC machine and an AC/DC one, you will have more options with the AC/DC machine. If the price is a big issue, then you can get welding just fine with an AC welder. One of the most important factors to consider when it comes to selecting the best stick welder is the “Duty Cycle”. What’s the duty cycle of a stick welder? A duty cycle is the length of time a welder can run before it needs to be turned off in order to cool. The less expensive welders have shorter duty cycles, while the more expensive welders have longer duty cycles. Longer duty cycles are critical when welding thicker metals that require more time on task. For home and hobby welders, a duty cycle may not be as important a factor as it would be for professional welders in a shop. Duty cycles of a stick welding machine are based on 10 minute period. For example, a 200 amp stick welder with a 30% duty cycle must be “rested” for at least 7 minutes after 3 minutes of continuous welding. Most stick welders are sold with a 20% or 40% duty cycle. Some of the best stick welders from leading manufacturers such as Lincoln Electric, AHP Tools, Miller…offer the best duty cycle rating up to 60%. After reviewing some of the best stick welders that are available, we picked the AHP AlphaTIG 200X 200-Amp IGBT AC DC Tig/Stick Welder as the best for most people. This is a combination of Stick welder and TIG welder. It has a nice, old-school panel, featuring knobs instead of the computer input panels many machines have these days. It’s very easy to use and understand. This stick welder is a perfect one for both beginners and professionals. It has a professional quality but the price is reasonable. The AHP AlphaTIG 200X only weighs about 38 lbs., it is not the lightest unit in its segment, but not a heavy model either. Instead, it is just perfect to move around. If you use it at home or in your garage, you probably imagine that you do not need too much portability. It includes standard TIG accessories and a control switch for the torch as well as a foot pedal to make using the TIG torch easier. It can handle heavy currents and voltage, which is especially nice for working with thin gauge metal. It can handle 1/4 inch aluminum, as well as 3/8 inch steel. It can also weld 6013 and 7018. One of the best parts of the AHP AlphaTIG 200X is its Advanced Inverter Technology with PWM. This technology is used to give a steady output voltage of 230 or 110 V AC irrespective of the load. The use of PWM technology makes the unit ideal for all types of loads. That’s probably why this welder works extremely stable no matter what kind of power source you are using. Overall, we believe the AHP AlphaTIG 200X is one of the best stick welders for you. You can’t go wrong with it. The Lincoln Electric Power MIG 210 Multi-Process Welder is one of the best welding machines from Lincoln Electric, which is one of the world leaders in the welding industry. Versatile, rugged and simple to use. 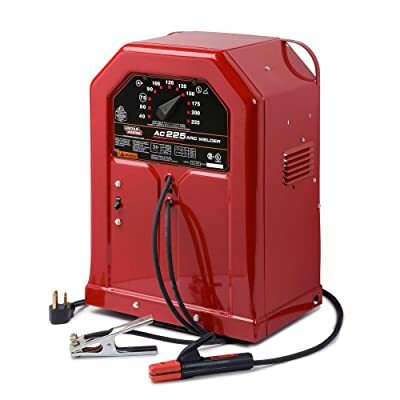 This multi-process welder gives you a powerful 210 Amps, allowing you to tackle any job. 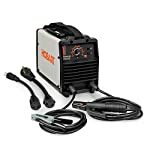 It’s perfect for the hobbyist, educator or small contractor who wants to do MIG welding and a lot more, including stick, TIG and flux-cored welding. Like the AHP AlphaTIG 200X, the Lincoln Electric Power MIG 210 MP is very lightweight, only 40 pounds. It looks small and outstanding. It comes with dual voltage inputs of 120V or 230V, meaning you can plug it into any common power supply. The all-metal wire drive and sturdy sheet-metal construction make it rugged and ready for any job in the home or small shop. It has intuitive push-and-turn digital controls along with a large colour display guiding you through the setup process, making it ideal for novice welders who are looking to grow in their field. The advanced options and settings are simple to access as well. 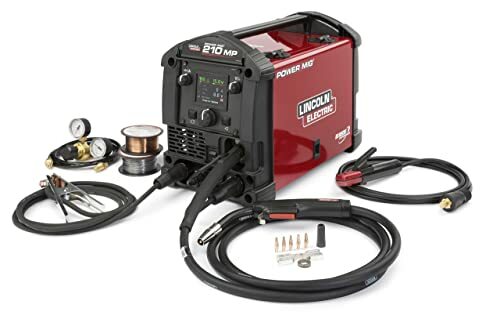 There are a lot of things that going for the Lincoln Electric Power MIG 210 MP welder but after all we believe this is one of the absolute best stick welders for you if you want a model that can do it all. As the Lincoln Electric AC225S Stick Welder is very easy to control and provides an extremely smooth AC arc for welding a wide variety of materials, it’s probably the best stick welder for you if you’re a beginner and just want to use a welder for small home repairs or hobby welding. 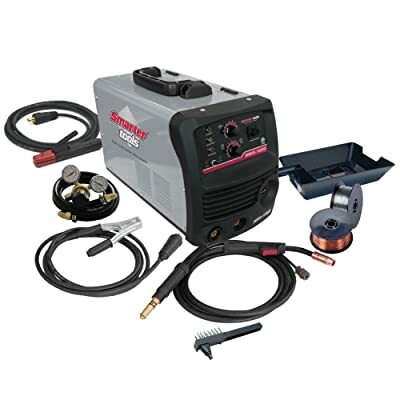 This is also one of the best selling welders that Lincoln Electric has made so far. The Lincoln Electric AC225S features a broad welding amperage range of 40 Amp – 225 Amp which produces a smooth arc regardless of the metal you are welding. With this smooth arc, it’s easy to weld with a variety of electrodes. This powerful machine is designed for 16-gauge metals and higher and is capable of welding multiple metals, including steel, cast iron and stainless steel. An insulated electrode holder and cable and a heavy-duty work clamp and cable help set this machine above the rest. However, for those looking for the best stick welder that has DC output, the AC225S is not an option. This one only offers an open circuit voltage of 230 Volts plus 225 Amp AC output. Consider the Lincoln Electric K1297 AC/DC 225/125 Arc Welder if you want DC output. This one has the same proven design as this stick welder but adds the smoother, more stable DC welding arc. 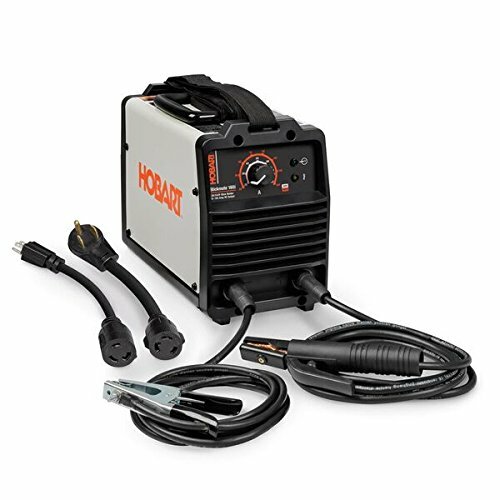 Hobart makes some of the best stick welding machines in the world and the Hobart Stickmate 160i Stick Welder is one of the most dependable, portable, powerful stick welder you can buy, even if you don’t use it everyday. This stick welder is lightweight, portable and comes with an adjustable shoulder strap, so you can bring the welder to the work, a great solution for farm use. We was very impressed with the price, this Hobart stick welder has a very high quality but is much cheaper than the AHP and Lincoln Electric. It features 120V/240V input power infinite amperage control for precise and accurate amperage control and heat output, adjusts output by as little as one-amp increments. When Miller Electric releases a new machine, they don’t just add another toy to the sandbox of options. When Miller Electric comes to market with a new machine, they create a whole new playground! The Miller Multimatic 215 Multiprocess Welder (907693) is the latest offering in Miller’s line of go anywhere, do anything machines. If you’re a fan of Miller machines, you’ll have noticed that they’ve gotten smaller and more powerful in recent years. The Multimatic 215 is based off the same smaller, lightweight inverter-based footprint of the recent Millermatic machines and will once again return Miller Electric to the dominant position among the multi-process options in the marketplace. The Miller Multimatic 215 is the all-in-one welder which is capable of MIG, Stick and TIG welding. It comes standard with a color LCD screen and features Miller’s Auto-Set Elite. The Auto-Set Elite sets MIG, Stick and TIG welding parameters automatically, all you need to do is enter metal thickness and welding wire or tungsten electrode diameter. It also allows you to fine tune weld settings manually to suit your individual preferences. This feature can be used on multiple materials and will save you ton of time. Many users suppose that this welder is much better than the Lincoln PowerMig 210 MP Welder. We don’t have an opinion on that but in our test the Miller Multimatic 215 worked smoother and cooler. 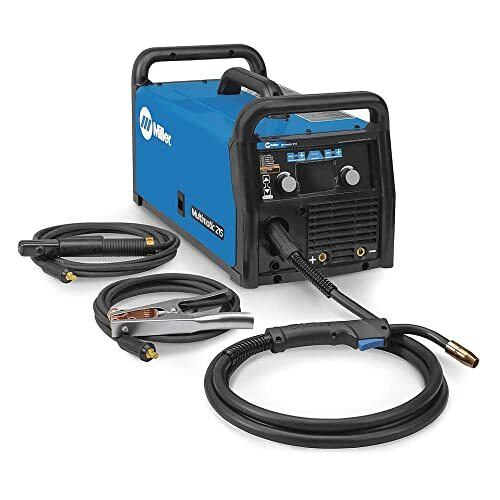 In summary we think the Miller Multimatic 215 is one of the best stick welder for professional body-man that needs to weld different thickness of sheet metal and the need for TIG or MIG from time to time. In addition, this would be a great unit for different tradesmen that need a good weld from time to time. Obviously, the DIY’er and hobbyist would fit this machine near perfectly. 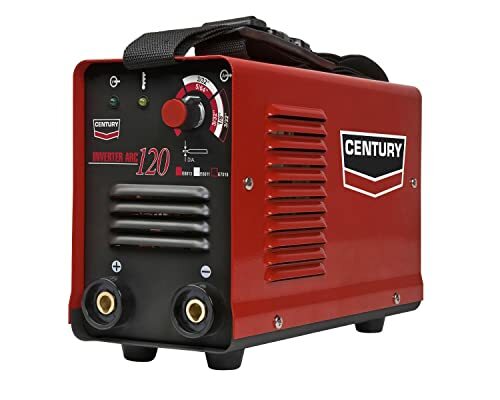 Weighing only about 16 pounds, the Century Inverter Arc 120 Stick Welder is probably the lightest welder on the market. It’s designed for those who want a small welder for small projects around the house or farm. It has a 10 to 90 amp output that supports mild steel stick electrode diameters from 1/16″ to 5/64″. The smooth arc provides strong welds on 18 to 14 gauge sheet metal. A 20% duty cycle allows it to run 2 minutes out of each 10-minute period without overheating. A continuous amperage control permits exact temperature setting for consistent welds. It comes with a shoulder strap, work cable, electrode holder, work clamp, and input cable with attached plug —> One of the best DC stick welders for Beginners.